If you have knee pain or problems, your physical therapist may pay close attention to your hips and the strength of your hip muscles. Why? Because your hip muscles, like the gluteus medius, control the position of your knees when you are walking, running, or jumping. Knee pain is a common problem that often requires the help of a physical therapist to treat. Pain in the knee can be caused by many things including arthritis, trauma, or repetitive strain . Knee pain is a common running injury, and it may limit your ability to walk, run, or climb stairs. If you have knee pain and work with a physical therapist, you may be surprised that he or she focuses a lot of attention on your hips. If your physical therapist doesn't check your hips, perhaps he should. Here's why. To understand the connection between knee pain and your hips, you must first understand some basic anatomy. The hip is a ball and socket joint and is a major weight-bearing joint in the body. There are many ligamentous attachments that add to the stability of your hip. There are also many muscular attachments around the hips that help control the motion of the joint and your leg. One muscle group around your hips that is receiving much scrutiny as a cause of knee pain is the gluteus muscle group, namely the gluteus medius. The gluteus medius helps to abduct your hip and thigh, which means that it pulls your leg out to your side. It also rotates your thigh outward when you are sitting, and it helps other muscles rotate your thigh inward when you are standing. When you are standing and walking, the gluteus medius is also active keeping your pelvis level. When your gluteus medius muscle becomes weak, it allows your thigh to rotate and pull inwards abnormally. This is called a "collapsing kinetic chain." This abnormal position of your thigh can put excessive stress and strain around your knee joint and kneecap (patella). A collapsing kinetic chain is often cited as an indirect cause of an anterior cruciate ligament (ACL) injury. The athlete is running or jumping, their knee collapses in (possibly due to weak glutes), and the knee buckles in, tearing the ACL. If you are experiencing knee pain, you should visit your doctor or physical therapist. He or she can evaluate your condition to determine the cause of your pain. A thorough evaluation and assessment of your gait, lower extremity strength (including hip strength), flexibility, and range of motion can help your physical therapist provide the proper treatment for your condition. If your physical therapist finds that you have weakness in your gluteus medius and that your thigh turns inwards abnormally during walking and running, then you may benefit from a strengthening program to target specific hip muscles. Be sure to work closely with your physical therapist to understand your condition and what to expect from physical therapy. If your gluteus medius is weak, then your physical therapist may prescribe specific exercises to help strengthen this muscle. Basic hip strengthening exercises may help, but often you will need more advanced hip strengthening exercises to help strengthen your gluteus medius. Other exercises, like the pelvic drop exercise, can also be effective in strengthening your gluteus medius. Since weakness in your hips can affect the position of your leg and your knee, often balance and proprioception exercises are beneficial in restoring normal control and position of your thigh. Use of a BAPS board may help to work on muscular control of your leg and thigh. This can help strengthen your entire lower extremity, placing your leg in an optimum position and taking stress off of your knee. By working on improving your hip strength and overall balance, you may be able to keep your knees in the correct position and, ultimately, relieve your knee pain. Be sure to check with your doctor or physical therapist before starting any exercise program to ensure that it is right for you. If you have knee pain, a physical therapy evaluation should include an assessment of your hip mobility and strength. 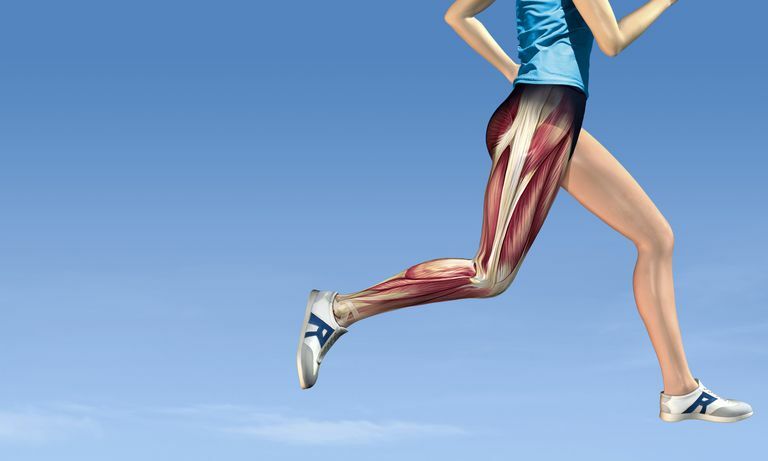 Weakness in muscles around your hips, namely your gluteus medius muscle, can affect the position of your thigh and knee when you are walking, running, or climbing stairs. Weakness in the hips can cause a collapse of the kinetic chasing, and this may be one cause of your pain. By working closely with your physical therapist, you may be able to strengthen your hips, take stress off of your knee, and return to your normal activity level quickly and safely. Brund RBK, Rasmussen S, Nielsen RO, Kersting UG, Laessoe U, Voigt M. The association between eccentric hip abduction strength and hip and knee angular movements in recreational male runners: An explorative study. Scand J Med Sci Sports. 2018;28(2):473-478.